We’d love your help. Let us know what’s wrong with this preview of EveryDayCook by Alton Brown. To ask other readers questions about EveryDayCook, please sign up. Probably not many people actually “read” a cookbook, right? But when that book is by Alton Brown, you are doing yourself a disservice to simply look at the recipes. It’s funny, insightful, and fascinating. I’d expect nothing less from the creator of “Good Eats” the hands down best show ever on Food Network. 1. Almost every recipe comes with a brief description as to why he likes it or some history of the dish, which is fascinating reading on Probably not many people actually “read” a cookbook, right? 1. Almost every recipe comes with a brief description as to why he likes it or some history of the dish, which is fascinating reading on its own. 2. He has separate sections about what you should have in your pantry as basics, and what equipment you need. Be warned that some of the pantry items are pretty unique and if you live in a remote rural location, you’ll probably be challenged finding them all. For myself, the most daunting undertaking would be acquiring all the cooking tools needed. I don’t own a food processor. Or a dutch oven. Or a pressure cooker. And I recently lost my blender to an ill-fated attempt at pumpkin puree. But I’m strongly considering acquiring or re-acquiring all of them as I can afford them. 3. The food looks terrific. How can you go wrong with something called Snapper Dome which requires 3 POUNDS OF SALT (for baking, not for actual consumption, but still…3 POUNDS OF SALT)! I’m anxious to try out many of these recipes. Oh, and I had the pleasure of meeting him and getting my book signed at a reading thanks to the keen eye of my wife! 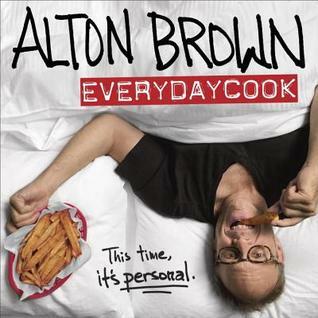 This is a great cookbook by Alton Brown! It has a good mix of recipes, and a few healthy ones. All are easy recipes. Worth keeping in your kitchen! Two things I like in a cookbook...BIG pictures and selections that include something I might actually eat. Winner, winner...chicken piccata dinner. Oh, and a good index. I may even try fish sticks for the very first time. Seriously. This is not a beginners cookbook; however, it is highly entertaining. I did actually read it cover to cover and enjoyed myself, even though I will probably never cook or eat anything in it because I am a picky child. There are a ton of great dishes and the pictures are amazing. All taken with an iPhone if I remember correctly. A lot of pictures, humor, and a dash of science behind these recipes. These were chosen by AB because they are his favorites, his go-to dishes. I may try a few of these, but many are outside my taste zone - not to mention the equipment requirements. Although I am aware of, and actually admire, Alton Brown's eccentric and scientific approach to cooking I was mislead by the title of this cookbook. These recipes feature foods I can't imagine wanting to create daily, using recipes I can't imagine being able to locate regularly, using equipment I certainly don't want to clean daily. I had a good laugh at the equipment featured, honestly. I have quite an arsenal of cooking gadgets but this was so extra. Some of the best ones: a 14 inch cast iron c Although I am aware of, and actually admire, Alton Brown's eccentric and scientific approach to cooking I was mislead by the title of this cookbook. These recipes feature foods I can't imagine wanting to create daily, using recipes I can't imagine being able to locate regularly, using equipment I certainly don't want to clean daily. I love Brown's attitude toward food. It's obvious he likes to eat, and his recipes are always both accurate and easy to follow. My skill as a cook owes him some credit. This time there are a couple of things to say. One refers to an oyster po' boy. Of course the instructions for cooking the oysters are perfect, but after having eaten po' boys in southern Louisiana and Houston, I have to say that if you can't get the right bread, just forget the whole thing. The bread needs to be very crisp on th I love Brown's attitude toward food. It's obvious he likes to eat, and his recipes are always both accurate and easy to follow. My skill as a cook owes him some credit. This time there are a couple of things to say. One refers to an oyster po' boy. Of course the instructions for cooking the oysters are perfect, but after having eaten po' boys in southern Louisiana and Houston, I have to say that if you can't get the right bread, just forget the whole thing. The bread needs to be very crisp on the outside, light as a feather inside, and a home baker doesn't have the sort of oven to do this. In my part of NC, the "French bread" is delicious, but a heavy and dense version that is all wrong for a po' boy, or for any sandwich, IMO. I was watching the latest episode of "The Tunnel" last night and reminded that everytime the characters are eating in France, they consume French bread sandwiches--not especially spectacularly filled (probably just some of that wonderful French ham), but the bread collapses as they bite into it and the mikes pick up that marvelous crunch. I am so hungry I want to drive 900 miles tonight to NO!!! I really loved reading the section on hardware especially but also pantry and methods. Alton Brown has such a good way of explaining things with a little fun snarky tongue in cheek thing going on. As for browsing the recipes, there are some I want to try, some that sound good but also seem really intimidating and some that seem out of my taste-bud range or just plain unrealistic for me to ever do. I mean, it's interesting that this book is called everyday cook, but in reality this is not a book f I really loved reading the section on hardware especially but also pantry and methods. Alton Brown has such a good way of explaining things with a little fun snarky tongue in cheek thing going on. I mean, it's interesting that this book is called everyday cook, but in reality this is not a book for noobs or everyday home cooks. It's for people looking to up the level of their cooking game. Be prepared to go out of your comfort zone and cook with anchovies and nos handheld whipped cream dispenser (but probably not in the same recipe. I adore Alton Brown. He is, in fact, on the list of people I'd like to have a martini with (especially if he wants to make the appetizers!). His recipes are always solid & this collection is no exception. Some of these are recipes he's already shared- on line or on tv- but there are also plenty of new ideas to explore. He does use some less-than-common ingredients but nothing that seems to hard to get my hands on. I can't wait to try some of his ideas. I liked it. The recipes that I tried worked. I enjoy Alton's sense of humor. I can definitely see myself making a lot of these recipes! I really love Alton Brown but I'm not really a great cook. So this is a bit over my head, but it's colorful and fun and a lot of interesting sounding recipes. Funny, insightful... and this is a book full of recipes. I'm a huge fan of Alton Brown, and have been since Good Eats. My mom used to watch Food Network relentlessly, and my brothers and I despaired at how it was the only thing on our one television all day long. But then Good Eats arrived, and it was the one show my whole family loved. I got to meet Alton at his signing and get this book signed (got a copy signed for my mom as well), and I'm excited to try the recipes within. This is a beautiful cookbook written in typical Alton style. Brown loves to give you the science behind how recipes work. Do you want to know what Alton has in his pantry? ...in his hardware (utensil) drawer? ...in his spice collection? ...at his bar? You can learn all this through wonderful pictures and descriptions. I can't wait to try his "My Big Fat Greek Chicken Salad", "Chicken Parmesan Balls", and "The Last Pizza Dough I'll ever Need"! Yes I read cookbooks, especially ones written by Alton Brown. I enjoyed this one a lot as it was filled some useful recipes and lots of funny commentary. My one quibble about this book is Alton comes across like a very grumpy old man in places and his "do this because I said so" humour wears thin in places. Otherwise, a great read. Alton Brown's Everyday Cook contains a good deal of wisdom, clever hacks and food prep shortcuts, as well as a good deal of humor. Oh, and there's even a salad here that contains chocolate! Seriously. The book is arranged by meals, starting with Breakfast Carbonara (yum!). It likewise contains recipes and instruction for relatively uncomplicated desserts that you'd make on any given day such as blueberry pound cake in a Bundt pan and a riff on peach cobbler called peach "cobbles;" assorted salads Alton Brown's Everyday Cook contains a good deal of wisdom, clever hacks and food prep shortcuts, as well as a good deal of humor. Oh, and there's even a salad here that contains chocolate! Seriously. No Can Tomato Soup and Grilled cheese, p 52-53 - I loved the method of cooking the tomato soup in the pressure cooker, but it wasn't my favorite taste wise. The grilled cheese was wonderful. My husband had fun grilling the sandwich. Turkey Sliders, p 63 - delicious. Even my picky brother ate them. Brussels sprouts with bacon, p 137 - amazing. This is a keeper for sure. Served these with the sliders. Peanut Butter Cookies, p 97 - easy and delicious. A bit crumbly though. Chicken Parmsean Balls with Weekend Sauce, p 76 - WORTH THE COST OF THE BOOK! This recipe is a keeper. As is the sauce, which could stand on its own for a quick meal. Roasted Thanksgiving Quinoa Salad, p 71 - good, healthy dinner. I added dried cranberries because why not? Oatmeal - I'm not a fan of oatmeal, but I like to try things I don't like every once in a while to see if a different method or recipe might change me. Nope. My son liked it though. Got it from the library. Now I have to actually go out and buy it so I can keep it forever. It is interesting to see the personality in this book in comparison to the others. His organization is stellar. Like few others, Alton can describe a recipe or technique in a way that I can almost taste the product through the page or screen. It wasn't always this way, but boy, has he developed a talent...he should do food entertainment for a living, or something. Full disclosure, I'm a fanboy. I've seen al Got it from the library. Perfect everyday cookbook. Alton Brown, although goofy, is certainly entertaining and his recipes are always tasty. Every book he's written and all of his television series are good for several tips you'll incorporate into your own kitchen and this one is no different. Infused oils was the big tip from this tome, but there are a lot more. Even the more complex dishes don't seem all that complicated when he explains them. I've tried a couple of these and also used some of his ideas in other dishes Perfect everyday cookbook. Alton Brown, although goofy, is certainly entertaining and his recipes are always tasty. Every book he's written and all of his television series are good for several tips you'll incorporate into your own kitchen and this one is no different. Infused oils was the big tip from this tome, but there are a lot more. Even the more complex dishes don't seem all that complicated when he explains them. The color chatter is quite interesting, even when there are too many rare ingredients, extra stages, or the recipe calmly calls for extra monotaskers like a smoker for a fondue recipe. I admit I am am far more imporessed when the recipes are more budget and pantry friendly. A lot of these recipes call for ingredients that are not staples and equipment than many homes just do not have the space or money for. The issuee, alluded to in the pizza dough recipe, is more common. These recipes are everyd The color chatter is quite interesting, even when there are too many rare ingredients, extra stages, or the recipe calmly calls for extra monotaskers like a smoker for a fondue recipe. Extremely fun book. The title is misleading-It may be every day if you are a chef, but some of the recipes and equipment needs are quite technical or specialized. However, most are quite doable. I haven't tried any of these yet, as I got the book at the library, and I have to return it. But the chicken parm meatballs look great, so I will have to try when I get the book. The notes at beginning of each recipe are really fun, especially the Fish Sticks and Custard one, at least in my house. Alton Brown is an American food personality, cinematographer, author, and actor. He is the creator and host of the Food Network television show Good Eats, the miniseries Feasting on Asphalt and the main commentator on Iron Chef America. Brown received a degree in drama from the University of Georgia. He first worked in cinematography and film production, and was the director of photography on the m Alton Brown is an American food personality, cinematographer, author, and actor. He is the creator and host of the Food Network television show Good Eats, the miniseries Feasting on Asphalt and the main commentator on Iron Chef America. Brown received a degree in drama from the University of Georgia. He first worked in cinematography and film production, and was the director of photography on the music video for R.E.M. 's "The One I Love". He also worked as a steadicam operator on the Spike Lee film School Daze.